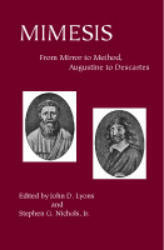 Title: Mimesis: From Mirror to Method, Augustine to Descartes Authors/editors: John D. Lyons and Stephen G. Nichols, Jr. Series: Critical Studies in the Humanities Imprint: The Davies Group, Publishers soft cover 296 pp. $24.00 US ISBN 978-1888570687 January, 2004 Mimesis: From Mirror to Method, Augustine to Descartes is a critical collection focusing on the intersections of art, history, literature, philosophy, and theory. It is this fifth term, “theory,” that marked the volume’s significance during the early 1980s—a time of heightened conflict over the newly emerging role of “theory” in the humanities. As Stephen G. Nichols notes in his new preface, “[s]ince so much poststructuralist thought has focused on representation, it was natural, if not inevitable, for scholars involved in the project to turn to mimesis, representation as imitation, for a concept that bridged the historical and the contemporary.” This, of course, has not been the first time that mimesis has played a key role in “bridging” an intellectual divide. The onto-theological dimension of Medieval thought brings together the Judeo-Christian Creator and the Platonic-Aristotelian metaphysics of Being as just one instance of the importance of mimesis in conjoining philosophical divisions. From Eugene Vance’s exploration of Augustine’s metaphysics to Timothy J. Reiss’s discussion of representation and modern political theory, Mimesis offers a truly interdisciplinary and wide-ranging historical inquiry into a foundational concept in the arts, literature, and philosophy. First published in an era in which “theory” was portrayed as the antithesis of humanistic study, this collection provides a necessary account of a new synthesis of the humanities and theoretical inquiry. With the persisting tensions within the humanities now over the future of theory, Mimesis: From Mirror to Method, Augustine to Descartes recaptures a critical element in this long debate, providing a sophisticated analysis of mimesis and demonstrating a unique theoretical method of scholarship. Contents Retrospective Preface Introduction Eugene Vance, Saint Augustine: Language as Temporality Stephen G. Nichols, Jr., Romanesque Imitation or Imitating the Romans? Kevin Brownlee, Reflections in the Miroër aus Amoreus: The Inscribed Reader in Jean de Meun’s Roman de la Rose Marina Scordilis Brownlee, Autobiography as Self-(Re)presentation: The Augustinian Paradigm and Juan Ruiz’s Theory of Reading Robert Hollander, Imitative Distance: Boccaccio and Dante Nancy J. Vickers, The Body Re-membered: Petrarchan Lyric and the Strategies of Description Murray Krieger, Presentation and Representation in the Renaissance Lyric: The Net of Words and the Escape of the Gods Thomas M. Greene, Erasmus’s “Festina lente”: Vulnerabilities of the Humanist Text Terence Cave, The Mimesis of Reading in the Renaissance John D. Lyons, Speaking in Pictures, Speaking of Pictures: Problems of Representation in the Seventeenth Century Michel Beaujour, Speculum, Method, and Self-Portrayal: Some Epistemological Problems Juan Bautista Avalle-Arce, Novelas ejemplares: Reality, Realism, Literary Tradition Timothy J. Reiss, Power, Poetry, and the Resemblance of Nature Contributors Notes Index About the editors John D. Lyons is Commonwealth Professor of French at the University of Virginia, where he has taught since 1987; he was previously professor of French and Italian at Dartmouth College. He is the author of A Theatre of Disguise; The Listening Voice; The Phantom of Chance: From Fortune to Randomness in Seventeenth-Century French Literature; Before Imagination: Embodied Thought From Montaigne To Rousseau. Stephen Nichols, James M. Beall Professor of French and Humanities at Johns Hopkins University, specializes in medieval literature and its interactions with history, philosophy, and history of art. He holds an honorary doctorate from the the University of Geneva and was made an Officier de l’Ordre des Arts et Lettres by the French Government. In 2008, he received a Research Prize from the Alexander von Humboldt Foundation. In 2010, he received a Mellon Emeritus Research Fellowship.Recent publications include Rethinking the Medieval Senses; L’Alterite du Moyen Age; Medievalism and the Modernist Temper; The Whole Book; The New Medievalism; and Mimesis from Mirror to Method, Augustine to Descartes. Romanesque Signs received the Modern Language Association's James Russell Lowell Prize for an outstanding book by an MLA author.